Are you at least going to help with the clean-up? You do look very sorry. TAKE THAT DADA! A guy has to find his entertainments where he can. I guess you told him, huh Dennis? Gotta love the guilty look, too. Looks like you need an adventure to keep you busy! Job well done Dennis. I am sure he got the point!!! I was afraid you might end up missing MangoMinster 2011. Whew. So did dada get the message? Oh boy Dennis… I think you’re daddy got the message! Haha! Good job, Dennis! That’ll show him! I am always very much in awe of your de-stuffing prowess. It makes my picture today look like puppy-play. I shall have to study your techniques harder. Ha ha ha! Dennis, you managed to miss getting some feathers on the chair. I’m sure you can rectify this soon, since dada will be busy! Look at that mug, though! How could you be angry at him? Was that a cushion? Once?? Surely it’s snow!!! Dennis, your face tells the whole story – hope Dada got the message. Woo know what your publikh demands! I dunno Dennis – is any part of that mug of yours photoshopped? To us, you look as if… well… you feel a bit smug about that truly great job you did there. Oh my, snow falling down from the ceiling? That’s not a mess, that’s installation art! Oh it looks like birdies got in your house and lost all their feathers. You found the best way to let him know! Dennis, you are an inspiration to us, although you strike terror into mama’s heart. We’ve taken to destuffing sofa pillows, but we haven’t moved up to destuffing sofa cushions yet. Looks like excellent if fleeting entertainment. And dada gets a lot of “thinking” time to cogitate on his book while he’s cleaning up, so really you’re helping his creative process. Good of you to post photos of you and Trixie while your dada is so busy. We like to see visual proof that you’re all alive and well. whoooaaaaaa. this say a lot. Gudness golly gosh Dennis, yoo reely did a good job of riping its inards owt. I haven’t eva dun that eksept for my prevyusly deeseest teddys. Oh I kild anuva wun to def yestaday & woz gunna post it on my blog wot daddy finks is reely his blog but he beet me to it wiv anuva silly cartoon. Man! He really tore it UP! P.S. to James: Hope your book is going well! Hurrah for you! First the cushion, next the couch!!!!! 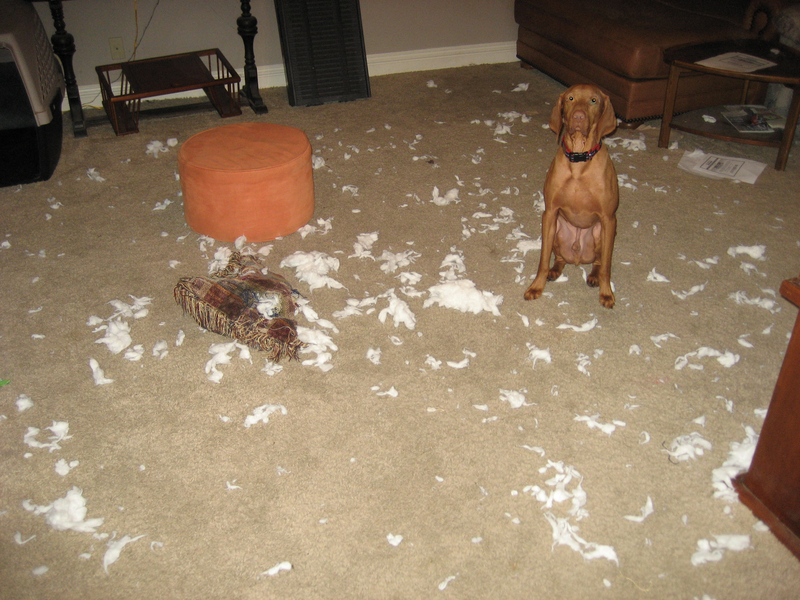 Wow, I think it looks suspiciously like a pillow self-destructed in your house. Now, I can personally vouch for the fact that sometimes these things do this when we dogs are busy, then we take the blame. I’m sure that’s what really happened. You would never, well, hopefully never do this and risk the rath of the peeps. My guess is that it was a fluff destruct moment and you just happened to be there in the aftermath. Dada should know that your adventures keep you out of trouble, so this seems only natural to us. Hey wow Iooks to me that I haven’t missed a beat. Still up to home decorating. PS- dada needs a break sometimes. perhaps your muppet pals can entertain us while he’s on break.